This bridge carried the LNER railway line from Bradford to Wakefield and had a safe height of only 14ft 6 inches therefore a very low bridge by current standards. It was said by local HGV drivers that if your wagon could pass under Flushdyke Bridge safely then there were no other bridges as low anywhere on the long drive down the A1 to London. In those days, the M1 didn't exist and the A1 was the main arterial road between the north and south of the country. The building depicted on the left was a water pump house, which had a very deep well inside. It was also known as the 'Stay' or 'Staives' where the mineral railway from Low Laithes pit at Gawthorpe used to empty, i.e. the end of the Paddy Line. It was also an area where local children played cricket and 'knurr and spell'. 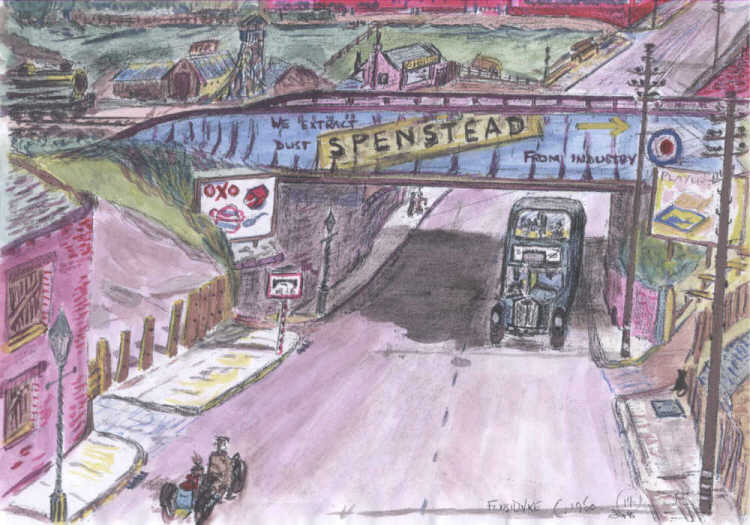 The entrance to the Spenstead engineering works is under the bridge on the right. Over the bridge and to the top of the picture is the disused Tarmacadam Works, the fish shop and Flushdyke School. On the right hand side of the bridge are the old steps that lead up to Flushdyke Station (closed in 1941).